This rug, which is remarkable for its extraordinary beauty and fresh colours, has a rare design composed of two square compartments, each of which contains a large diamond-shaped medallion with a cross-like ornament in the middle, with smaller diamond-medallions in the corners. Some 15th century rugs are known with animals in compartments, and a few have diamond-shaped medallions with quarter-medallions in the corners, but none are quite like the Halchiu. 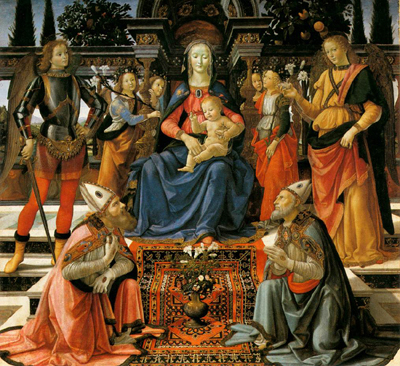 A rug with the same overall design scheme - but very different details - is depicted in Domenico Ghirlandaio's Madonna and Child Enthroned with Saints, 1480-1485, in the Uffizi Gallery, Florence. 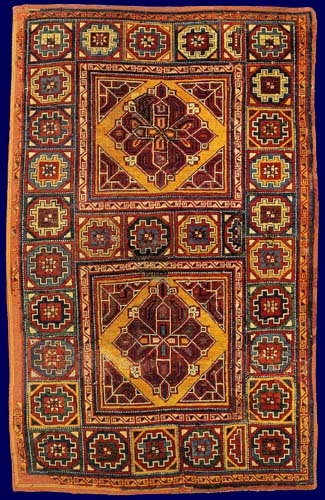 An 18th century rug with a similar design survives in the Evangelical Church in Cincu, and related medallion forms continued to be used in western Anatolia, particularly in the Bergama and Canakkale regions, through into the 20th century. The border pattern is divided into square compartments each filled with an octagon, then a 'double-cross', then a square and in the centre an eight-pointed star. The minor border, which surrounds the compartments as well as the perimeter of the rug, has an angular boxed-'S' design, as can also be seen on the famous Marby Birds and Trees rug, also from 15th century Anatolia.